Melvina is seconded to Matter of Focus one day a week as part of our ongoing support to Future Pathways. Melvina is a researcher at Future Pathways with particular responsibility for engaging people supported by Future Pathways to understand how the organisation is contributing to improving outcomes and what more can be done. Melvina is being supervised in this work by Ailsa and using her time with Matter of Focus to further develop her knowledge and skills in outcome evaluation. 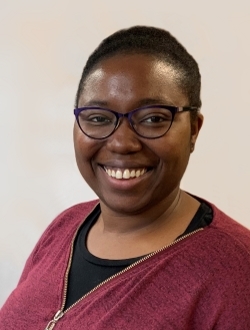 Melvina has recently completed a PhD in anti oppressive social work at the University of Strathclyde looking at the experience of Black African mothers raising children on the autism spectrum.